I’ve been getting lots of questions lately about what I’ve purchased since my shopping freeze ended. So I thought I would share a couple of those items with you today. 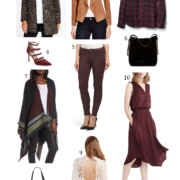 What I’ve noticed about myself is that I shop with a much more discerning eye when I’m coming off a spending hiatus. 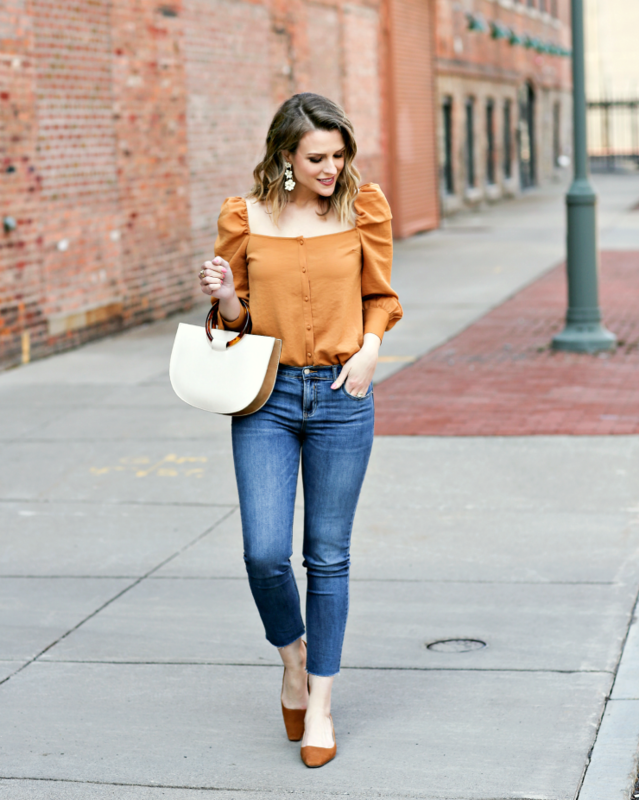 In this case, I knew I was all set with wardrobe basics for spring, so I limited myself to looking for items with special details or interesting silhouettes that would be fun additions to my closet. This puff sleeve blouse caught my eye because the color is so unique and unlike anything I own. At first I wasn’t sure if it would be flattering on my skin tone, but I kind-of love it! 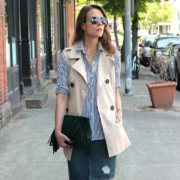 I think this will also transition easily into fall, which is always an added bonus. Other pretty tops that I’m eyeing for the season: this v-neck blouse (love the lace detail! ), this square neck top (perfect for summer), this white eyelet top & this tie-front blouse. These floral drop earrings are such a fun statement piece for the season and, thanks to the fresh white finish, they will pair seamlessly with all your spring tops & summer dresses. The best part about these is that they are actually convertible, so you can wear them as a single floral stud or connect the bottom half for maximum impact. Chloe & Isabel sent me some jewelry from their latest collection, which was inspired by the breathtaking sights of Kyoto, Japan. If you’re not familiar with this brand, they offer well made jewelry that’s affordably priced – I’d say it’s similar in quality to Stella & Dot. I’m a long-time fan and I’ve had some of their pieces for years & all of it has held up beautifully with no tarnishing. They were kind enough to offer an exclusive discount for PPF readers – you can get 15% off your purchase sitewide using code KYOTO15 through April 30th. This is a great way to pick up some pretty Mother’s Day gifts & get your shopping done a little early (or treat yourself)! 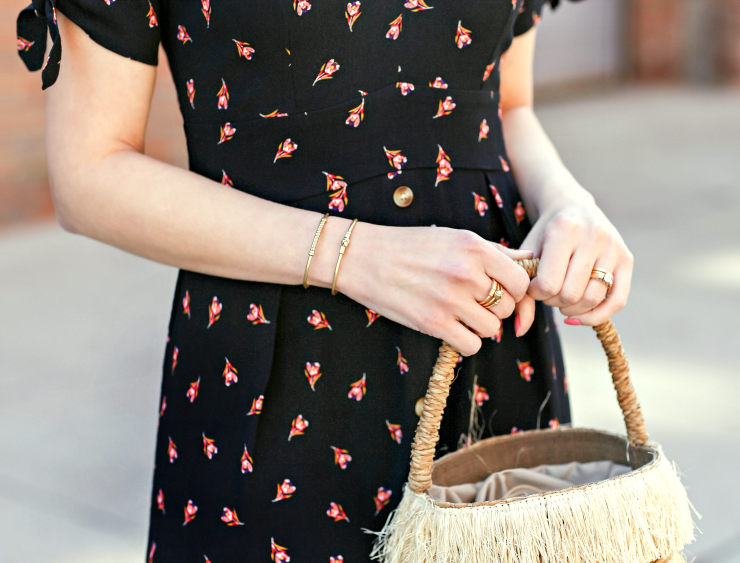 This floral dress is probably my favorite recent purchase – the fit is just perfect and I love the little details that give it a vintage-inspired vibe (like the tie sleeves & button accents). Unfortunately, this exact colorway sold out before I had a chance to share it here, but it comes in two other prints here & here. Other floral dresses I’m loving include: this wrap dress (I wore the longer version here), this midi dress, this buttoned maxi, this ruched dress and this tie-front mini.